Ripe fruit, pineapple, notes of cognac, this nose initially gives off a great freshness. It evolves slowly but surely towards more creamy notes. With a few drops of water, a superb balance is formed between the fruity notes on the one hand and the toffee on the other hand. The whole is very fragrant. Very nice with spices, woody notes and a texture reminiscent of peach syrup. Clove, cinnamon, the finish is very smooth, but also drying on its great length. Dry herbs. With water, less tannic, giving pride of place to the fruits and the length becomes quite exceptional! Final, 4/5, 5/5 with water. For sure the fruitiest Bunna ever - of course you need to like it and I like it very much even so I would never bet that it's a Bunna. 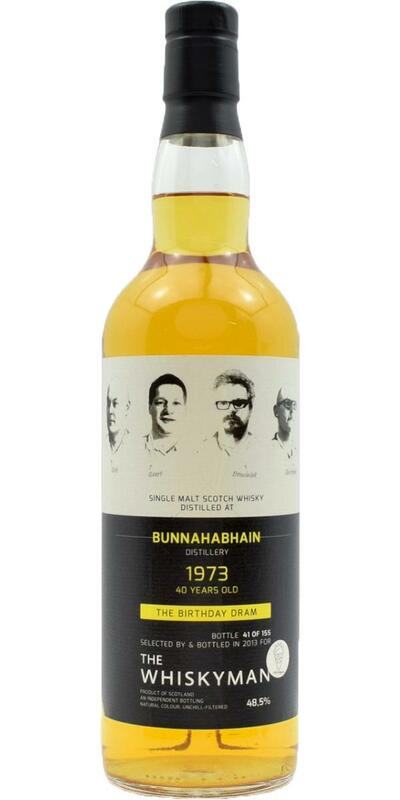 It reminds me very much on the series of great old Speysiders also from 1973 and about 40yo. It seems that 1973 was the year of fruity whiskies. Anyhow really excellent! Extremely fruity, intense tropical fruits, bananas galore, mango, papaya, passion fruit, honey, creme brulee, other overripe fruits, hints of solvent, whiffs of oak wood - superb! Very oily, creamy, mellow, thick, sirupy, good sweetness, plenty of fruitiness, fine notes of oak wood, good level of acidity, very ripe fruits, lemons, spices, white pepper - fantastic! N: Its one of those ‘aah’ drams, perfectly-sweet & creamy, served with a supreme fruit salad [strawberries, apples, melons, papaya,…], custard creams and pastries galore - all of it waxed-up like apples & pears prepared for a Green Grocer display. Add a few herbs [marjoram, spearmint perhaps], sweet dandelion & burdock, other floral fragrant delights, ginger beer, sweet prune juice, dates,… you get the picture. In short, a heavenly aromatic/fragrant, tropical fruit-basket>herbal candle. T: I didnt take this home for ‘under-the-microscope’ scrutiny, i simply wanted to enjoy more of its 'super-happy place'. F: Aside from the [tropical] elixir-sweet fruit basket, theres a key counter note of bitter-sour dunnage & sweet-bitter mandarin citrus running underneath - one which naturally belies this malts true grand age. C: And what of age, and score for that matter? - just a number, that's what. Joy in a glass right here, a fine way to celebrate life [starting] at 40. This was bottled by four Flemish friends to celebrate their 40th birthday’s, two of which were manning the Whiskyman stand at the Old & Rare weekend in Glasgow. 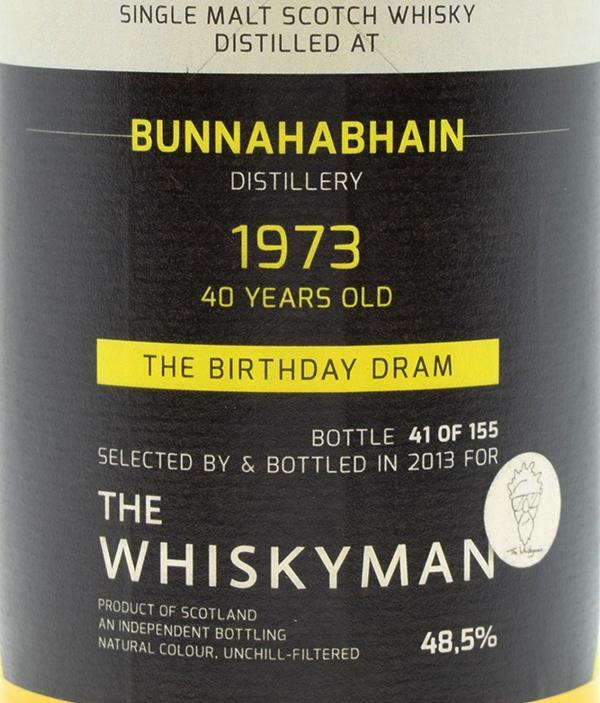 With only 155 bottles in total split between them, it’s a treat to be trying this - not least because 2013 was also my 40th year and Bunnahabhain remains one of my heart distilleries. N: Papaya & mango alongside a myriad of other waxed fruits & flora and then all the bananas - especially those small sweet ones you get in abundance down in Trivandrum. T: There’s more tropical-ness embodied in a succulent saline<waxy<nectar mix, creating an intoxicating palate and moorish mouthfeel. I love this, it’s right up my street. F: It keeps on exuding it’s elixir - 40yo yet forever young. Having some water with it this time. With a few drops of water there is even more fizz and its creamy and fruity with it. The main thing is the bitterness has completely gone and its quite thick now. Yeah this is a great old Bunna. My score goes up to 92p. Bottled maybe slightly a year or two too late but that's being picky, this is an excellent aged Bunna. Wet grass, hay, lime, cream & jam sponge, mango, peach and hints of orange marmalade. Very fizzy on the tongue and there are some ham notes with a slight bitterness from the wood which is expected at this age. Hints of brine. Smells a bit young and grassy at first, but quickly gets fruitier (ripe summer fruits) with a mineral side that adds depthness. Rather long, on the same profile.